The Vision of the Seas offers guests upgraded facilities and amenities, as well as unique experiences such as the opportunity to witness sea views from 40 meters above water! The Vision of the Seas is a member of Royal Caribbean's Vision Class. All ships in this class have been recently updated with new cabins, electronic gadgets and dinner occasions. Other Vision Class ships include Rhapsody of the Seas and Enchantment of the Seas. In the center of the ship guests will find several activities to fill the day. Climb up to 40 meters above the water for a spectacular view. If you are not a fan of such heights, stay with both feet on deck for a game of miniature golf. Children can enjoy themselves in the underwater adventure of ocean carnival games to talent shows. For excellent meat dishes it is best to sit down with Royal Caribbean's Signature Chops Grille Steakhouse. Enjoy an exclusive dinner at the chef's table. Experience an intimate meal and enjoy the matching wine in the Viking Crown bar and lounge. There are dining and entertainment options to suit all tastes and lifestyles. On board Visions of the Sea you are spoiled with choices. 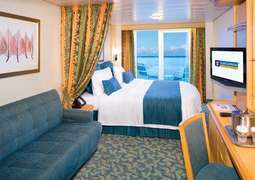 All cabins aboard the Vision of the Seas are comfortable, classy and great value, ranging from Inside, Outside, Balcony cabins to luxurious Suites. 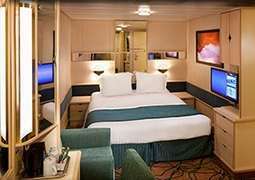 Each stateroom has its own specific requirements and on board Vision of the Seas you'll find the perfect stateroom to suit you in no time. 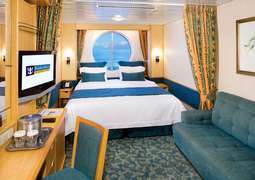 Family cabins are also on offer and with 14 wheelchair accessible cabins Vision of the Seas caters for everyone. Culinary indulgences are awaiting you in the different restaurants on board the Vision of the Seas. Feast in one of the theme restaurants, from the 'Chops Grille' its signature steak house to an intimate experience at the 'Chef's Table' or enjoying fascinating freshly made sushi in 'Izumi Asian-Fusion Cuisine'. For those ice cream lovers you can spend hours eaten frozen treats at Ben & Jerry's Ice cream place on board. You will not get bored on board this ship thanks to its extensive entertainment programme. Every day on board is different to the next with a wide range of shows to choose from each evening you'll be spoilt for choice. Spectacular Broadway shows are preformed each evening in the theatre which spread over two floors, along with a one of a kind mesmerising acrobatic show one that you will be sure not to forget any time soon. If you like to take a risk in life be sure to try out the Casino Royal where you will have a chance to try your luck. As well as 8 bars and lounges on board you can choose from many different types of bars which each offer unique features from 'Enchanting Evening' lounge to the 'R Bar'. Activities on board are endless, leaving you spoilt for choice. For those who love action and adventure, you won't be short of that on this cruise ship with a rock climbing wall, a video game arcade with all the latest technology and an upper deck jogging track you'll have a ball of a time. For the younger passengers there is plenty of fun in store for them with Adventure Ocean Youth Program, expanded teen-only hangout area and Royal babies or Royal Tots. For a family fun day there is contests, games, lecture and enrichment classes for everyone to get involved in. An amazing new fitness centre and athletic track are available for the actively inclined, or you can spend time taking it easy in the pool area, with an option of two different pools and to keep the younger passengers entertained while you relax there is and outdoor poolside movie screen. If you feel like winding down take a trip to the Vitality Spa and enjoy a massage and many more treatments on offer as well as relaxing in the wellness area or get your hair and make-up done for the evening in the beauty salon. The shops on board offer everything you might need on your journey, as well as fine selection of jewellery, cosmetics and perfumes, as well as everyday items in the General store. Welcome to the MS Vision of the Seas and upon first glance one can see that it is indeed a vision of beauty and magnificence. She was launched in 1998 by Royal Caribbean International as part of their Vision Class group of ships and like most of the others in her class she was built in the commune of Saint-Nazaire in Western France at the Chantiers de l’Atlantique shipyard. Sprawled out over 11 decks, she has much to offer in the way of entertainment, dining and of course living quarters. She travels to beautiful destinations throughout the Caribbean, North America (including the United States East and West Coasts), Central America (including the Panama Canal), South America, the Pacific, Northern and Western Europe and the Baltic. On board the MS Vision of the Seas you will see many favourite brands present on other Royal Caribbean International cruise ships therefore you can expect the same high level of service and customer satisfaction from all these great eateries. Start with the Main Dining Room which is as homely as it sounds and serves food at every meal, every evening there is a new dish so no two nights will ever be identical! If you are the type of person who prefers to have the greatest choice in their dining then the Windjammer Café is perfect for you as there is an array of dishes from all over the world available in a delicious buffet throughout the day. For delicious frozen desserts drop by Ben & Jerry’s® Ice Cream, for a small extra price. Coffee lovers should definitely make a trip to Café Latte-tudes where they can enjoy a number of coffee drinks and snacks. Additionally there is always the option to order room service and have a nice relaxed meal in the comfort of your own living quarters. The number of leisure activities aboard the MS Vision of the Seas is indeed endless and there is so much to do that every passenger is spoilt for choice. In addition to being able to enjoy the fantastic ocean view on board a gorgeous ship you can take part in many different activities. For an onboard adventure which you would not expect from a cruise ship there is an amazing rock climbing wall which allows you to see 40 feet above the deck to enjoy an exhilarating view of the surroundings, and as the cost of this activity is included in your fare you can try it time and time again. Those who like to keep fit even on their holidays should take a trip down to the Fitness Center where you can work out while enjoying a breathtaking view outside. There are also different classes for activities such as Pilates, yoga and sculpting, which is not only brilliant in order to learn new skills but also make new friends too. For a fantastic night out there are various bars and lounges on board where you can drink and be merry or dance the night away. There is also the chance to try your luck at the many slots, tables or tournaments at the enormous Casino Royale®. Of course on board a cruise there will always be the chance to have a swim in the pools, but on board the MS Vision of the Seas there is an adults-only pool called the Solarium where you can relax away from the hubbub of the rest of the ship. There are also 6 whirlpools available to relax in during your stay with a phenomenal view of the ocean as they jut out over the edge of the ship itself. There are also many shops with duty-free items such as clothing, accessories, jewellery and perfume.